Next up in my series of old work is this one, an impression of the clouded 1999 Eclipse, that we experienced in it's 100% zone near Baden-Baden (Germany) at that time. This object of mixed recycled materials is mainly a wooden panel of 55 x 75 centimetres. 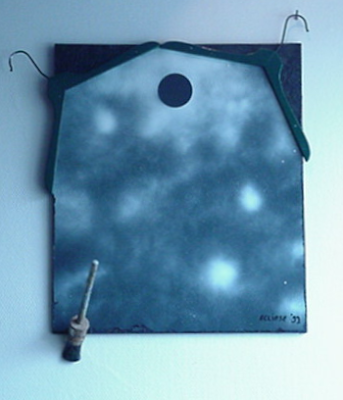 The object is painted with white spraypaint on a black background. It is finished with several layers of transparant matte paint. The sides of the panel and left and right upper-corners are covered with a water-based bitumen-product that i don't remember the name of anymore.